We don’t know why neither the vendors or solution providers embrace performance metrics – we love measuring stuff! 63% of the vendor respondents indicated they measure the success of their partners on year-over-year sales growth and 43% measure net new customers. Both of those are great metrics to have on individual partners and the ecosystem as a whole. However, they focus on customer acquisition versus the more value-based elements of customer success and satisfaction. Only 18% of the vendors indicated they measure the satisfaction of their partners’ customers and only 7% measured partner satisfaction. In an industry where we obsessively measure the customer experience, journey and satisfaction, having less than 10% of the vendors measure partner satisfaction is incredibly disheartening. Maybe if vendors invested more in their partner management systems we’d have better measures of performance metrics. On average, the vendors spend only 3% of their channel budget on their partner management (PRM) systems. With just a little more investment the vendors could have much more robust partner scorecards that summarize each partner’s and each individual’s activities – from training to certifications, marketing activities and ROI, deals registered and customer satisfaction scores. Sales are important but they’re not the only measure of a valuable partner. When we asked the partners what program elements (other than margin!) are important to their decision to work with a vendor, we could have predicted the results based on last year’s State of Partnering report. The partners prioritized training and support elements which enable them to be successful selling, implementing and maintaining a solution for their customers. Vendors want solution providers to drive sales and revenues. Partners want to provide a full solution to their customers’ business needs, ensuring they return to purchase more. The more vendors can focus on what partners want, enabling their success with customers, the more likely partners will continue to sell and support that vendor’s solutions. If you focus on their success, your success will follow. 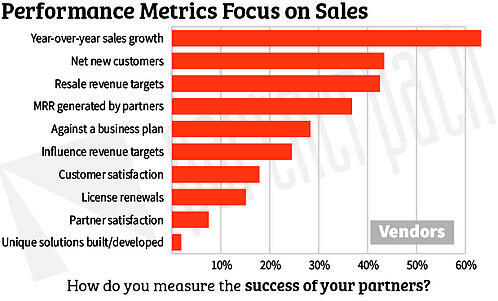 What partner metrics do you track? Have you asked your partners what program elements are important to them? Take a hard look at the answers to these questions and take steps to future channel success. If you need help, let us know.